Obv: Bust of Elizabeth D. G. ELIZABETA. AVGVSTA. OMN. ROSS. 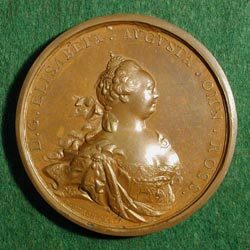 Elizabeth was the daughter of Peter the Great. New Serbia was a district near the modern Novorossiisk, in the Black Sea region. 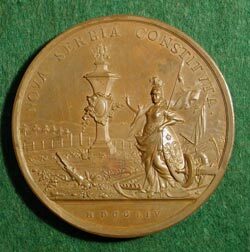 The medal praises the Empress Elizabeth for supporting the Serbs in their struggle against the Ottoman Turks.